Matthew is a undergraduate nuclear engineering student studying at the University of Tennessee. His interest in the field of nuclear engineering started in high school when he participated in a summer research program for appalachian students at Oak Ridge National Laboratory. While working in a supercomputing group, he learned about Oak Ridge’s historical importance to the Manhattan Project. In awe of the power of the atom and fascinated by the use of nuclear energy for electricity production it was this experience that compelled him to study nuclear engineering. At the University of Tennessee he devotes most of his time towards serving the community of engineering students as the President of the Engineering Mentor Program (EMP). EMP is a student-led organization that provides first and second year engineering students with an upperclassman mentor in their major. The goal of the organization is to create a more interconnected and open community of engineering students. Research constitutes another large part of his life. 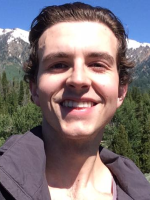 He has participated in internships at Oak Ridge National Laboratory working under Dr. Lou Qualls, researching Pu-238 production and usage for space missions, as well as at Idaho National Laboratory working under Dr. Donna Post Guillen, researching high level waste vitrification. In addition, Matthew also conducts research at the University of Tennessee under Dr. Arthur Ruggles researching Positron Emission Particle Tracking (PEPT) as a method of measuring fluid flow and studying turbulence. In his free time Matthew rows for for the Tennessee Crew Club, runs marathons, hikes in the Smoky Mountains, is active in the UTK chapter of the American Nuclear Society, edits Pursuit: The Undergraduate Research Journal of the University of Tennessee, and writes for Your Everyday Science Blog.